After a Christmas break the chef proprietor Dario Bellantoni has returned. Easy to detect how the name of this Italian restaurant came about. But it is difficult to understand where some of the additional comments below their name come from but more in a minute. 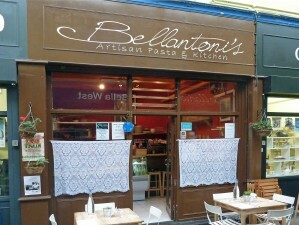 It is spread across two sides of an alleyway in Brixton Village with one side an open kitchen and a few tables and on the other a small dining room – in between the windswept alleyway with tables which is where we ended up – only daring to remove our gloves to eat. Choosing is easy – the menu is blessedly short with seasonal dishes – antipasta, homemade vegetarian pasta dishes (I mean everything including the pasta) and some more substantial fish dishes and stews. We ordered antipasta between the three of us and as it is meant for two sharing we raced for our favourites but luckily there was enough for everyone to try all the separate pieces …. dried tomato, rocket, chorizo, olives which look the colour of pecans and mozarella and burrata. Burrata is made from mozarella and cream and is a smooth texture and was served at the right temperature so it was creamy or, as Dario told u,s buttery from the Italian “burrata” . It goes well with the bread and oil that comes with the whole antipasta dish. For mains we chose the lasagne with ricotta and spinach, spicy tomato and chorizo stew and monkfish in a saffron sauce. The lasagne was definitely enough but for a balanced meal I should have chosen a salad as well. The chorizo stew was stupendous – soft and slightly spicy with the tomatoes not too acidic. The only weak point was the monkfish, with a remarkably small portion of fish for what was described on the menu as a main course, hardly any vegetables and very little sauce that simply didn’t have enough flavour anyway. The choice of desserts is even more limited and we ended the meal with two tarts (one apple and cinnamon, one banana) although they were in fact pieces of pie rather than a tart. Both came accompanied by a dollop of mascarpone. The banana was our favourite. We drank a bottle of the red Sardinian wine that was on the specials list. It was fruity and not to heavy and kept us warm until the main courses arrived. There were cheaper bottles and glasses on the menu – all as we remember Italian. The price for the whole of our meal was about £25.00 per person but we did have more wine and the expensive main dishes. As a sideline this restaurant offers cooking classes for anyone who has now run out of ideas fop birthday surprises. Our own piece of advice (apart from do try this restaurant) is to book early and get a seat inside during the winter months.